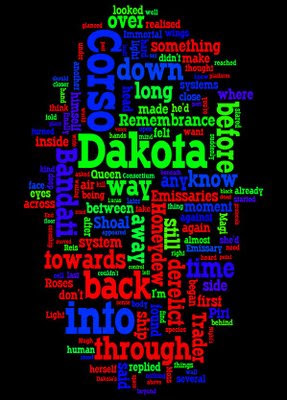 I read about a piece of online software called Wordle on Justine Larbalestier's blog; it takes a piece of text - even a whole book - and turns it into a picture of the most common words based on frequency. In terms of what's important in the plot of the new book - that being the text I fed in - it's actually pretty accurate. 'Remembrance' and 'Honeydew', by the way, are the names of two characters.